Small autonomous robots built by UC Santa Cruz engineering students will face off in a competition based on the popular "Game of Thrones" television series on Friday, December 12, at 6:30 p.m. The event will be held in the Media Theater on the UCSC campus and is free and open to the public. The robotics competition is the final project for students in the Introduction to Mechatronics class taught by Gabriel Elkaim, professor of computer engineering in the Baskin School of Engineering. Every year, Elkaim comes up with a different challenge for his students. The project gives students an opportunity to apply all the knowledge and skills they have learned in the class to solve an open-ended problem. The students work in teams to build a "droid" or robot that can operate autonomously, with no help from the students once the game starts. 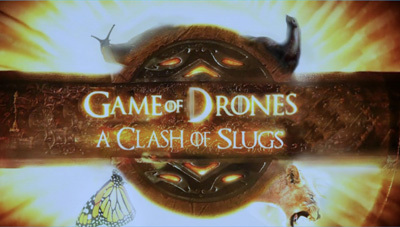 This year's competition is called "Game of Drones: A Clash of Slugs." The task requires students to build robots that can navigate the field of play, infiltrate the castle of the reigning monarch, and bring the "crown" back to their home castle. In each round of the tournament, two teams will compete as rival castles both trying to steal the crown from the ruling castle.